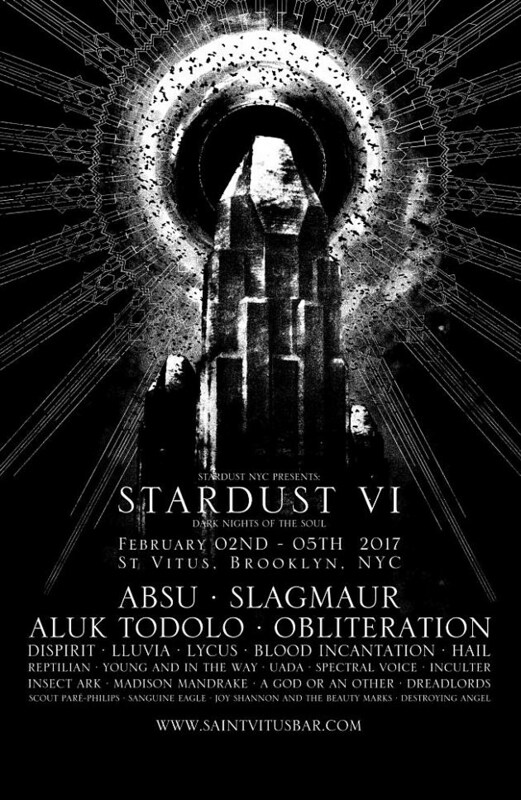 Saint Vitus is playing host to the cosmically-inclined extreme metal festival Stardust Fest once again in 2017. The 4-day event brings in a ton of underground metal bands from all over the place for a long weekend that promises to be weird, heavy, and spacey in equal measure. Going down from February 2-5, the lineup includes Absu, Slagmaur, Aluk Todolo, Blood Incantation, Obliteration, Insect Ark, Young and in the Way, Lycus, Spectral Voice and more. The slant here is heavy on black, death, and funeral doom metal, but most of these bands have a shared kind of mythological, star-gazing slant that goes against the typical kind of blood-and-guts approach of bands that you would find on say, Saint Vitus’s Martyrdoom fest. Tickets are available for both individual nights and for the whole fest. Check out the full daily lineups below.